Russia may impose a ban on European air carriers using trans-Siberian routes to Asia in response to Europe's sanctions targeting the Russian low-cost airline Dobrolet, the Vedomosti newspaper reported on Tuesday. "Russian officials are considering the possibility of imposing restrictions or even a ban on transit flights by European airlines to Asia over the territory of Russia," a source close to a Russian company working with major European air carriera, a high-ranking Russian official and a person close to these discussions told the newspaper. 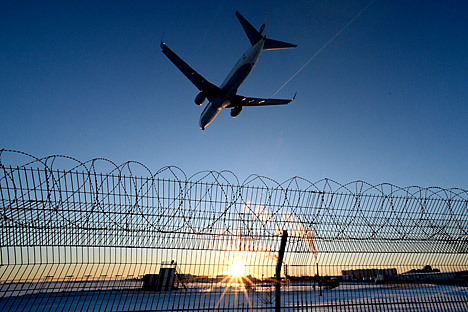 One of these sources told Vedomosti that discussions on possible restrictions for European airlines using trans-Siberian routes began shortly after the first wave of the European Union's sanctions against Russia. The latest events, including Dobrolet's decision to ground its flights and fines worth $8.6 million that have been imposed by Ukraine on Russian air carriers operating flights to Crimea, require a response, he said. It is up to the Russian government to adopt such a decision, he said. Consultations are currently under way at the level of the Transport Ministry and the Foreign Ministry, he said. A decision concerning this issue has not been adopted so far, a high-ranking Russian official told Vedomosti. The Russian prime minister's press secretary, Natalya Timakova, for her part, told the newspaper that the government's secretariat "had not received such proposals from the agencies concerned." Russia's Aeroflot gets the over-flight fees from European airlines that use the trans-Siberian route, which is the shortest route to Asia, Vedomosti reports. A source close to the Aeroflot board of directors told the newspaper that the Russian flagship carrier annually receives around $300 million in these over-flight fees. A source close to a Russian company that works with major European air carriers told Vedomosti that the biggest payers of these over-flight fees - Lufthansa, British Airways and Air France - are aware of the problem and have already estimated that the possible Russian measures may cost them more than 1 billion euros a year. The newspaper, however, has been unable to confirm this information. Meanwhile, a representative of the German Foreign Ministry told Vedomosti that Lufthansa had not requested information concerning a potential ban on trans-Siberian flights for European airlines either through official or unofficial channels. Spokespersons for Lufthansa, British Airways, European Commission President Jose Mauel Barroso and EU Transport Commissioner Slim Kallas have declined to offer their comments to Vedomosti. Representatives of Air France and the French Foreign Ministry have refused to comment either. "We are speaking about good revenue. One needs to thoroughly weigh the pros and cons in order to avoid acting like the Americans and Europeans, who are effectively striking their own head with a hammer," the Russian president's press secretary Dmitry Peskov told Interfax. Peskov said he does not know whether or not the country's ministries are discussing these measures. The source close to the Aeroflot board of directors has added that should European airlines be banned from using trans-Siberian routes, Aeroflot will not be able to honor some of its other commitments, which commercial airlines do not usually assume. "I mean both Sukhoi Superjet operations, which cost more than $50 million a year, and all social projects such as the air carrier's unprofitable routes and the Avrora airline, which is an important state project, but does not fit the business logic of an air carrier like Aeroflot," he said. An Aeroflot spokesperson has been unavailable for comment.